REI provides research and consulting services for industrial furnaces. This includes applications in the steel, aluminum, and glass industries. Most applications focus on enhancing product yield and improving furnace efficiency. Other applications involve reducing emissions such as NOx. High-temperature coal combustion simulations were performed to evaluate the impact of pulverized coal injection on blast furnace tuyere operation. 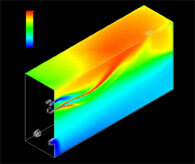 The REI combustion simulation tool GLACIER was used to model the system. Simulations were carried out to investigate the effect of coal type, blast composition and lance position. Simulations helped establish cause and effect relationships for different operating conditions on the tuyere exit temperature field, coal burnout and pressure drop within the tuyere nose. Simulation results were used to guide changes in tuyere operation and tuyere equipment changes. REI’s BANFF software was used to evaluate the impact of bias firing with different fuels on NOx emissions in a steel reheat furnace. Furnace firing with pure and blended coke oven gases was analyzed. Stoichiometries of the 20 burners were also varied to identify the optimum firing condition to minimize NOx and maintain uniform heat flux profiles to the steel slabs. REI’s BANFF software was used to optimize the burner design for radiant heating of the bath in an aluminum melting furnace. The furnace was fired with a single oxy-fuel burner and utilized multiple oxygen and nitrogen inlets to develop the desired species and heat flux profiles in the furnace.